Résumé: Dictionary of Canadian-French Clergy - Volume containing those deceased before the publication of the first volume. Résumé: Biographical Dictionary of Clergy Living Canadians at the time of publication. Résumé: A first addition to the Biographical Dictionary of the Canadian Clergy. Résumé: A monthly magazine, published in 1919, considered the fourth volume of the collection of the dictionary of the French-Canadian clergy. Résumé: New Complement of the famous biographical dictionary of the Canadian clergy-French. Résumé: Last volume of the series of the Dictionnaire biographique du Clergé Canadiens-Français. Résumé: In spite of its shortcomings and even more recent compilations, it has been possible to supplement or correct it. The Cyprien Tanguay Genealogical Dictionary, published between 1871 and 1890, is still today a leading tool for genealogical research in Quebec, from the origins to 1760. Résumé: Genealogical Research carried out and published by FL Desaulniers, Lawyer and former deputy for the families Gravel, Cloutier, Bruneau, Dufresne, Proulx, Douville, Charest, Buisson, Tessier, Panneton, Arpin, Cormier, Maher, Fontaine and Duval. Résumé: A genealogical census particular to the parish of Charlesbourg which mentions those who founded a family, as well as the year and place of their marriage within the parish. Résumé: In this volume, the author makes known the origin and establishes the filiation of some of the main families of the Richelieu valley. The colonizers of this rich and beautiful country were the sons or grandsons of the French colonists who settled in the old seigneuries of Sorel, Saint-Ours, Contrecoeur and Verchères. Résumé: Monograph of Jean Baillargé, Ancestor of Baillargé in America with a supplement dealing with Antoinette Baillargé, wife of Jean-Paschal Létourneau and Geneviève Baillargé, wife of Guillaume Bériau. Résumé: Small wedding monograph of the Blanchet family. Résumé: Small wedding monograph of the Choquette family. Résumé: A great genealogical research work for the time of Achille Chouinard under the pseudonym "Jacques de Gaspé". Résumé: History of an ancient noble family of Canada who arrived in New France in 1685. Résumé: A complete book by E. Z. Massicotte, whose mother was from the Descary family. Résumé: A small monograph of the Filteau family. Résumé: A small monograph of the Gosselin family by the parish priest of Charlesbourg at the time, Abbé Gosselin. Résumé: One of the many small monographs written by Abbé DeJordy, the latter of the Jeannotte family. Résumé: Great research on several families; Le Sage, Hudon alias Beaulieu, Béland, Martin, Hamelin. Résumé: A small genealogical work by Gérard Malchelosse, a member of his lifetime, of the Montreal Historical Society. Résumé: Beautiful research, considering the time, carried out by Massicotte, on his own family. Résumé: The Canadian branch of the Otis family descended from Richard Otis of Dovers, New Hampshire. Here is the first monograph written on this family. Résumé: Several genealogies gathered under this volume, The families Casgrain, Baby and Perrault meet there. Résumé: Album of the history of the Three Rivers: comprising: 1634. First page of the registers of the church. 1648. Election of trustee. 1648-1690. Signatures of the inhabitants. 1685. Plan of the city. 1685-1709. Cadastre of the seigneuries of the government of Trois-Rivières. 1700. The city and land in a circuit of a league. 1704. Map of the city, with legend. 1721. View of the city. Résumé: Register of all the municipalities and parishes that existed in Quebec until 1896. Résumé: A register with a brief history of all the parishes, missions and municipalities of Quebec. Résumé: Genealogical record of the Beaupré coast area. Résumé: Genealogical record of the parish of Rivière Ouelle since its origin. Résumé: Volume 1: Containing navigations, discoveries, and habitation made by the French in the West Indies and New France under the avowal and authority of our most Christian kings, and the various fortunes of these in the execution of these things, for a hundred years up to him - In what is understood the Moral, Natural and Geographical History of the said province; With the Tables and Figures of it. Résumé: Containing the navigations, discoveries, and dwellings made by the French in the West Indies and New France, with the avowal and authority of our King's Most Christian, and the various fortunes of these in the execution of these things for a hundred years up to now. Résumé: Third volume of this first account of the history of New France. Résumé: History of the parish of Saint-Denis-sur-Richelieu with a lot of genealogical information. Résumé: Monograph of the parish of Yamachiche. Résumé: Second part of the monograph of the seigneury of Saint-Ours and their families. Résumé: Re-establishing the chain of local traditions; to bring out the names of the oldest and principal families of the district, and to unite the opinions of the important men who have occupied this part of the province of Quebec, is, in a few words, the object of this volume. Résumé: Historical and genealogical survey of the city of Longueuil. Résumé: A classic in the history of New France. Résumé: 79/5000 History of this historical event with several genealogical information. Résumé: Complete history of the parish of Saint-Nicolas. Résumé: Last volume of the famous series of Champlain. Résumé: The history of the first Montrealers, recounted by a renowned genealogist of our time, Marcel Fournier and who, moreover, offered this volume to the public domain with generosity. Résumé: The Jesuit Relations are the collection of correspondence between the missionaries of the Society of Jesus sent to New France, and their religious superiors in Paris. The first were written in 1616, here is the one of 1641 and 1642. Résumé: The original design of this enterprise was a manual of tho events connected with the settlement of the township of Stanstead. ; But, with the advice of friends, it was thought best to attempt a history of the entire County. Résumé: Modest as a worker in this great undertaking of our national history, I have often been surprised to see a vivid light come from my notes on points which until then had been obscure or incomplete in our annals. The registers, which I have compiled in all the corners of our New France, have become a mine of precious information, which I have been fortunate enough to collect. Quote from the author about his book. Résumé: First of a series of 21 volumes published between 1918 and 1923, studies on historical facts and at the same time genealogical, written by Benjamin Sulte and compiled by Gérard Malchelosse. Résumé: Second in a series of 21 volumes published between 1918 and 1923, studies on historical facts and at the same time genealogical, written by Benjamin Sulte and compiled by Gérard Malchelosse. Résumé: Third of a series of 21 volumes published between 1918 and 1923, studies on historical facts and at the same time genealogical, written by Benjamin Sulte and compiled by Gérard Malchelosse. Résumé: Fourth in a series of 21 volumes published between 1918 and 1923, studies on historical facts and at the same time genealogical, written by Benjamin Sulte and compiled by Gérard Malchelosse. Résumé: Fifth in a series of 21 volumes published between 1918 and 1923, studies on historical facts and at the same time genealogical, written by Benjamin Sulte and compiled by Gérard Malchelosse. Résumé: Sixth in a series of 21 volumes published between 1918 and 1923, studies on historical facts and at the same time genealogical, written by Benjamin Sulte and compiled by Gérard Malchelosse. Résumé: Seventh in a series of 21 volumes published between 1918 and 1923, studies on historical facts and at the same time genealogical, written by Benjamin Sulte and compiled by Gérard Malchelosse. Résumé: Eighth in a series of 21 volumes published between 1918 and 1923, studies on historical facts and at the same time genealogical, written by Benjamin Sulte and compiled by Gérard Malchelosse. Résumé: Ninth in a series of 21 volumes published between 1918 and 1923, studies on historical facts and at the same time genealogical, written by Benjamin Sulte and compiled by Gérard Malchelosse. Résumé: Tenth of a series of 21 volumes published between 1918 and 1923, studies on historical facts and at the same time genealogical, written by Benjamin Sulte and compiled by Gérard Malchelosse. Résumé: Eleventh in a series of 21 volumes published between 1918 and 1923, studies on historical facts and at the same time genealogical, written by Benjamin Sulte and compiled by Gérard Malchelosse. Résumé: Twelfth in a series of 21 volumes published between 1918 and 1923, studies on historical facts and at the same time genealogical, written by Benjamin Sulte and compiled by Gérard Malchelosse. Résumé: Thirteenth of a series of 21 volumes published between 1918 and 1923, studies on historical facts and at the same time genealogical, written by Benjamin Sulte and compiled by Gérard Malchelosse. Résumé: Fourteenth in a series of 21 volumes published between 1918 and 1923, studies on historical facts and at the same time genealogical, written by Benjamin Sulte and compiled by Gérard Malchelosse. Résumé: Fifteenth of a series of 21 volumes published between 1918 and 1923, studies on historical facts and at the same time genealogical, written by Benjamin Sulte and compiled by Gérard Malchelosse. Résumé: Sixteenth of a series of 21 volumes published between 1918 and 1923, studies on historical facts and at the same time genealogical, written by Benjamin Sulte and compiled by Gérard Malchelosse. Résumé: Seventeenth of a series of 21 volumes published between 1918 and 1923, studies on historical facts and at the same time genealogical, written by Benjamin Sulte and compiled by Gérard Malchelosse. Résumé: Eighteenth of a series of 21 volumes published between 1918 and 1923, studies on historical facts and at the same time genealogical, written by Benjamin Sulte and compiled by Gérard Malchelosse. Résumé: Nineteenth in a series of 21 volumes published between 1918 and 1923, studies on historical facts and at the same time genealogical, written by Benjamin Sulte and compiled by Gérard Malchelosse. Résumé: twentieth of a series of 21 volumes published between 1918 and 1923, studies on historical facts and at the same time genealogical, written by Benjamin Sulte and compiled by Gérard Malchelosse. Résumé: Last of a series of 21 volumes published between 1918 and 1923, studies on historical facts and at the same time genealogical, written by Benjamin Sulte and compiled by Gérard Malchelosse. Résumé: The following study on the origins of Quartier Belvédère, or Banlieue de québec, appeared in the "Bulletin des Recherches Historiques "of the month of March 1915. Résumé: Registers of the seigniories belonging to the Crown, deposited at the office of the Receiver General and the Crown Lands Office, in accordance with the provisions of the Revised Statutes for Lower Canada. Résumé: Cadastre abbreviated to the seigniories of Montreal, deposited at the office of the Receiver General and the Crown Lands Office, in accordance with the provisions of the Revised Statutes for Lower Canada. Résumé: Cadastre abbreviated to the seigniories of the district of Montreal, deposited at the office of the Receiver General and at the office of the Crown Lands, in accordance with the provisions of the Revised Statutes for Lower Canada. Résumé: Cadastre abbreviated to the seigneuries of the District of Montreal, deposited at the office of the Receiver General and the Crown Lands Office, in accordance with the provisions of the Revised Statutes for Lower Canada. Résumé: Registers of the seigneuries of the District of Quebec, deposited at the office of the Receiver General and at the Crown Lands Office, in accordance with the provisions of the Revised Statutes for Lower Canada. Résumé: Registers of the seigneuries of the District of Trois-Rivières, deposited at the office of the Receiver General and the Crown Lands Office, in accordance with the provisions of the Revised Statutes for Lower Canada. Résumé: EXCERPTS FROM TITLES Former land concessions in fief and seigniory, made before and after the conquest of New France by British arms, in the part now called Lower Canada, taken from the registers deposited in the office of the Secretary of the Province, and by this officer certified to be valid: to serve as references to the respective Lordships on the topographic map of Lower Canada. Résumé: The Lacombe Act, An Act passed in 1903, the Liberal government of Simon-Napoléon Parent passed the voluntary deposits legislation through the Legislative Assembly, faced with the gluttony of creditors faced with the financial difficulties of certain citizens. The Lacombe Act, named after the Liberal member of Parliament for Sainte-Marie, Georges-Albini Lacombe, gives indebted families the opportunity to repay their creditors in a progressive manner without having to submit a seizure. Here is an index found on registrants' web on this register in October 1908 in the Montreal area. List certainly a bit darker but genetically interesting. Résumé: It appeared to us interesting to offer to the public the census, made in the year 1716, of the parish of Notre-Dame de Quebec, comprising, up to the beginning of this century, the city and a part of the suburbs. Résumé: We have converted this 2096-page book with text recognition and a search engine for better search facility. A magnificent book published in 2005 offered to the public domain by Marcel Fournier and Gisèle Monarque. Résumé: Extracts or precedents of the arrests taken from the registers of the superior council of Quebec. and dedicated to his honor Sir Francis Nathaniel Burton, Lieutenant-Governor, and to the other Honorable Members of the Court of Appeal of the Province of Lower Canada. Résumé: All the important facts that took place in the parish of St. Thomas before this locality was erected as a parish and to this day are scrupulously recorded in these notes. Résumé: The author writes: The thought of writing the story of St. Prosper was born of a feeling of filial piety. It is the parish of our worthy Bishop, Monsignor Cloutier. Genealogy of Cloutier families included. Résumé: Monograph of the Richer de La Flèche and Hamelin, and affecting the region of Sainte-Anne-de-la-Pérade and Grondines. Résumé: Second volume of the Duguay monograph also including the Marcouiller family, Diamond, and Bald. Résumé: First part of four of the inventory of prescriptions arranged in chronological order. Résumé: Part four of the inventory of prescriptions arranged in chronological order. Résumé: Third part of four of the inventory of prescriptions arranged in chronological order. Résumé: Last part of four of the inventory of prescriptions sorted by stewards. Résumé: Letters grouped by family name but family groups are not necessarily arranged in alphabetical order. An index is in the second volume. Résumé: Here is an index of the civil registers of the province of Quebec. The number of baptisms, marriages and burial are recorded there, classified by parish and years. An index of instutitions can be found at the end of the volume. Résumé: Classified chronologically for the French period, 1663-1758. The date, a brief description, the type of register and the parties involved are generally included. Most, however, are between the Sovereign Council and the King. Résumé: The great voyers of New France were great officers of the crown of France, who was responsible for royal roads, urban alignments, public squares, and the embellishment of cities in general. Here is the first volume of a series of six chronologically arranged for the years 1667-1840. Volume six is a directory of legal status, county by county. Résumé: The great voyers of New France were great officers of the crown of France, who was responsible for royal roads, urban alignments, public squares, and the embellishment of cities in general. Here is the second volume of a series of six chronologically arranged for the years 1667-1840. Volume six is a directory of legal status, county by county. Résumé: The great voyers of New France were great officers of the crown of France, who was responsible for royal roads, urban alignments, public squares, and the embellishment of cities in general. Here is the third volume of a series of six chronologically arranged for the years 1667-1840. Volume six is a directory of legal status, county by county. Résumé: The great voyers of New France were great officers of the crown of France, who was responsible for royal roads, urban alignments, public squares, and the embellishment of cities in general. Here is the fourth volume of a series of six chronologically arranged for the years 1667-1840. Volume six is a directory of legal status, county by county. Résumé: The great voyers of New France were great officers of the crown of France, who was responsible for royal roads, urban alignments, public squares, and the embellishment of cities in general. Here is the fifth volume of a series of six chronologically arranged for the years 1667-1840. Volume six is a directory of legal status, county by county. Résumé: The great voyers of New France were great officers of the crown of France, who was responsible for royal roads, urban alignments, public squares, and the embellishment of cities in general. Here is the last volume of a series of six chronologically arranged for the years 1667-1840. Volume six is a directory of legal statutes, county by county. Résumé: Index of Orders and Commissions of our Governors and Intendants, 1639-1706, Volume One of Two. Résumé: Index of Orders and Commissions of our Governors and Intendants, from 1639 to 1706, Volume two of two. Résumé: This summary of sovereign council judgments from 1717 to 1760 on seven volumes is a continuation of the first six volumes published in the late 1800s and covering the period from 1663 to 1716 inclusive. Graded chronologically, there is a brief summary of the judgments for each event. Résumé: Ce résumé sur des jugements du conseil souverain de 1717 à 1760 sur sept volumes est une suite des six premiers volumes édités à la fin des années 1800 et couvrant les période de 1663 à 1716 inclusivement. Classée chronologiquement, on y retrouve un bref résumédu jugements pour chaque événements. Résumé: This inventory is arranged in alphabetical order by the husband AND wife. The notary's notation and the date of the contract follow. 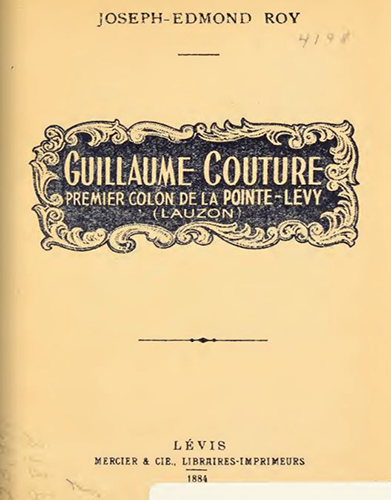 In six volumes for the period of the French regime. Résumé: An index of the work carried out in the late 1800s of the Judgments and Deliberations of the Sovereign Council of New France. Résumé: This collection contains concessions, certificates of confessions, confessions and enumerations, and certain notarized deeds on the North Shore and Labrador. Résumé: Le volume 2 contient un index de tout les testaments avec le nom, la profession, l'épouse le type d'actes et la date. Résumé: Le volume 3 contient aussi un inventaire des insinuations du régimie militaire à québec avec quelques insinuations de la prévôté de québec. Résumé: Généalogie de Charles Édouard Gagnon, Notaire de la région de Rimouski écrit par son fils Ernest. Résumé: Faciscule sur les seigneurs des Milles-Isles, de l'augmentation, de l'Isle à la fourche et de la baronniede Portneuf. Résumé: L'histoire de la paroisse de l'Ange-Gardien en passant par les curés qui y ont servis. Résumé: Un registre couvrant la période de 1779 à 1891 des ingénieurs et employés des travaux public du Canada. Résumé: Dictionnaire Généalogique comprenant les familles Canac-Marquis, Bégin, Bilodeau, Boissonnault, Lanouette, Létourneau, Marceau, Morency, Prémont, Roy, Turcotte et autres familles. Résumé: Un dictionnaire du clergé canadien, celui-ci classé chronologiquement. Résumé: Introduction à la collection de six volumes et transcriptions à partir des originaux de touts les jugements et délibérations du conseil souverain pour la période de 1663 à 1675. Un index se retrouve dans la catégorie du collectif d'archives de la province du québec. Résumé: Transcriptions à partir des originaux de touts les jugements et délibérations du conseil souverain pour la période de 1676 à 1686. Un index se retrouve dans la catégorie du collectif d'archives de la province du québec. Résumé: Transcriptions à partir des originaux de touts les jugements et délibérations du conseil souverain pour la période de 1686 à 1695. Un index se retrouve dans la catégorie du collectif d'archives de la province du québec. Résumé: Transcriptions à partir des originaux de touts les jugements et délibérations du conseil souverain pour la période de 1696 à 1704. Un index se retrouve dans la catégorie du collectif d'archives de la province du québec. Résumé: Transcriptions à partir des originaux de touts les jugements et délibérations du conseil souverain pour la période de 1705 à 1709. Un index se retrouve dans la catégorie du collectif d'archives de la province du québec. Résumé: Transcriptions à partir des originaux de touts les jugements et délibérations du conseil souverain pour la période de 1710 à 1716. Un index se retrouve dans la catégorie du collectif d'archives de la province du québec. Résumé: Réédition de 1866 de l'édition originale de 1636 des Récits de Gabriel Sagard, missionnaire français de Nouvelle-France. Résumé: Voici un extrait du Rapport concernant les archives canadiennes pour l'année 1905, volume II. Un excellent dictionnaire généalogique retraçant l'île d'Orléans par sa généalogie. Résumé: Accompagnée de quelques courtes notions sur ta dispersion des Acadiens en 1758 et d'une très gracieuse lettre du Rév. C.-A.-O. Savoie, Ptre. Chanoine et Curé de Ste-Ursule, Que. Ce travail lui est respectueusement dédié, ainsi qu'à mon cousin, le capitaine C.-O. Savoie de Kankakee, llls., en souvenir reconnaissant de sa constante affection. Résumé: Dictionnaire généalogique de la famille Casavant à partir de Jean Casavant dit LaDébauche. Résumé: Monographie de la famille Taschereau. Résumé: Résultats des recherches généalogiques de la famille de Mgr. Henri Têtu. Résumé: La Généalogie des Familles de la Côte de Beaupré, — œuvre de feu Messire Charles Beaumont, prêtre, — est nécessairement incomplète, étant donné, en beaucoup de cas, le manque de renseignements essentiels. Dans les Registres de plusieurs paroisses, il y a des lacunes considérables, parfois couvrant un espace de deux à trois ans; dans d'autres, ils sont souvent indéchiffrables à raison de leur vétusté; il y manque aussi beaucoup d'entrées qui n'y ont jamais été faites, les gens du temps n'y attachant pas l'importance qu'on leur donne aujourd'hui. Cependant, malgré tant de difficultés, le vénérable compilateur en a fait un travail d'un mérite réel, destiné a rendre de grands services au pays. L'orthographe des noms de famille, laisse beaucoup à désirer, j'ai cru devoir la réformer dans l'Index, — la laissant telle quelle dans le corps de l'ou- vrage; — il en est de même des noms propres. J'ai aussi fait subir à l'original quelques autres changements de moindre importance, afin de le rendre intelligible à tous. Résumé: Une grande recherche généalogique des Côté d'Amérique. Le livre est sous le domaine public. Le ISBN n'est plus valide et le livre est partagé à plusieurs endroits sur le web. Résumé: Petite monographie familiale d'une branche américaine des Belisle. Résumé: Grande monographie familiale en deux volumes de la famille Chabrier dit Vadeboncoeur. Libre de droit. Résumé: Ce livre n'est point une œuvre littéraire. Le curieux y cherchera en vain la description fastueuse de quelques grands événements. Il n'y trouvera ni des actions éclatantes, ni des batailles, ou des conquêtes qui ont illustré les règnes des princes fameux dans l'histoire. Le simple récit de la vie intimée de quelques paroisses perdues au fond du nouveau-monde ne peut intéresser le grand public. J'ai conscience, cependant, d'avoir fait un travail utile, l'œuvre de celui qui fouille le sol, déblaye le terrain et apporte une pierre à l'édifice commun. "avant-propos de l'auteur'. Résumé: Monographie généalogiques et historiques de la famille Trottier dit Beaubien. Titre: La Famille Demers d'Etchemin P.Q. Résumé: Monographie de la famille Demers avec des explications narratives des ancêtres pionniers. Résumé: Notes généalogiques et historiques de la famille Courtemanche. Résumé: Monographie de Saint Georges d'Henryville et de la seigneurie de Noyan . Résumé: Monographie de mariage des deux familles Casavant et Ravenelle. Résumé: Comprenant l'historique de l'émigration des Canadiens-français aux États-Unis, leur développement, et leurs progrès. Cet ouvrage contient aussi un historique des journeaux publiés depuis 1838 jusqu'à nos jours, les biogrpahies des journaistes, défunts et vivant, et un supplément sur les journaux publiés par des français à New York, en Louisiane et ailleurs. Résumé: L'histoire retracée des faits et gestes des familles établies à Etchemin depuis le commencement. Résumé: Je n'avais pas l'intention d'écrire une préface, et j'ai assez dit dans le chapitre d'ouverture pour indiquer les objets que j'ai gardés devant moi. L'histoire du Canada ne peut être écrite sans l'histoire du Scotchman, de l'anglais et de l'allemand au Canada; Le Français au Canada a trouvé son historien. «L'Écossais au Canada» est entre les mains d'un écrivain capable de faire justice à un grand thème et à une race extraordinaire, dont les actes ici comme ailleurs sont illustres avec des épisodes tels que l'établissement Red Eiver, planté sous la direction de Lord Selkirk, Par des hommes avec une bravoure déterminée comparable à celle des troupes allemandes à Gravelotte, tentant encore une fois la colline, clouée de puits de fusil, qui gardait la gauche française. Même les colonies mennonites entreront dans la compétence de l'historien et il devra faire face à une immigration américaine plus tard que l'U. E Loyalist, une immigration composée principalement d'hommes qui sont entrés au Canada dans l'intention de s'installer dans le Michigan, mais qui, quand Ils ont vu les splendides étendues de chêne près de Londres et les comtés voisins, installés ici. Parmi ces colons se trouvaient les Shaws, les Dunbars et les Goodhues. Il y avait une colonie orientale de la même classe, où on trouve les Burnhams, les Homers, les Keelers, les Smiths, les Perrys. Certains d'entre eux ont été amenés à venir au Canada par des incitations offertes par le gouvernement du jour pour construire des routes et construire des moulins. Par conséquent, dans de nombreux cas, nous trouvons les immigrants américains les grands brevetés où ils se sont installés. Dans l'index, je ne donne pas tous les noms, mais seulement les noms principaux. Résumé: Biographie d'Alexander Buchanan, Avocat et juge du québec, suivi de sa généalogie familiale. Résumé: Seconde édition entièrement refondue, considérablement augmentée de la généalogie des habitants de la région de Poitou. Résumé: Dictionnaire familiale se concentrant sur les familles Gouin et Allard en y incluant quelques familles collatéraux. Titre: History of Compton County and Sketches of the Eastern Townships, Districit of St. Francism ans Sherbrooke County. Résumé: Supplemented with the records of four hundred families. Two hundred illustrations of buildings and Leading citizena in the county. Résumé: Monographie historique de Saint-Léon-le-Grand en Maskinongé. Résumé: Histoire de la municipalité de Sainte-Anne des Plaines à l'occasion de l'érection de leur nouvel Église construite en 1900. Résumé: Notes historiques à partir de la période française de la paroisse de Saint-Thomas-de-Montmagny. Résumé: Ces Notes sont intéressantes en ce qu'elles donnent des détails sur un grand nombre des plus anciens habitants du pays, ainsi que sur beaucoup des familles canadiennes les plus remarquables. Elles fournissent également des renseignements, souvent précieux, sur les coutumes du temps, le prix de bien des choses, l'origine de certains noms encore en usage, etc. Résumé: Continuité de la première livraison avec la période commençant en 1720. Résumé: Petite monographie de la famille Langevin dit Lacroix comprenant la biographie de Mathurin Langevin. Résumé: La première partie est une biographie de l'ancêtre Gilles Lauzon et la deuxième partie contient la généalogie patronymique de plus de 500 familles issues en ligne directe. 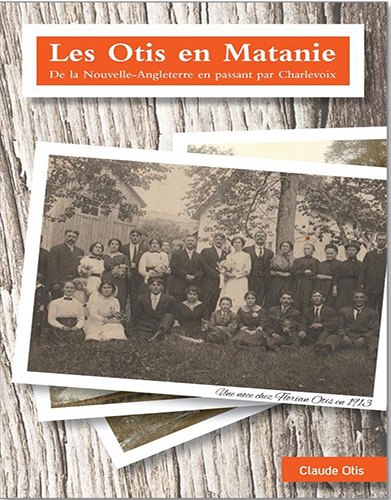 Résumé: Les Otis en Matanie présente le cheminement assez particulier d'une famille québécoise dont l'origine remonte à la Nouvelle-Angleterre et dont l'ancêtre est John Otis. En 1689, celui-ci alors âgé de 9 ans est amené captif de Dover, petit village de la colonie du New Hampshire, vers la Nouvelle-France, où il prendra le nom de Jean-Baptiste Otis. C'est l'ancêtre de la branche canadienne des Otis. Cet ouvrage s'attarde à deux de ses descendants, les frères Jean et Benjamin Otis, lesquels vont s'établir dans le Bas-Saint-Laurent, au début du 19e siècle. Ils seront les ancêtres de milliers de descendants qui vont migrer vers la plupart des régions du québec, au Nouveau-Brunswick, en Ontario et en Nouvelle-Angleterre. Les Otis en Matanie se présente comme une épopée familiale et s'adresse non seulement à des lecteurs portant le patronyme Otis, mais aussi aux descendants d'une trentaine d'autres lignées qui se sont unies par mariage à des filles portant ce patronyme. Le contexte général fait aussi que cet ouvrage peut être lu avec intérêt par n'importe lequel lecteur. Résumé: Sous le règne de Louis XIV pour contrer la disproportion entre les sexes dans la colonie de la Nouvelle-France, de jeune filles célibataires firent la traversée dans le but de se marier. Audacieuses, aventurières certaines sont venues dans l'espoir d'un avenir meilleur et ont contribués à cette encore jeune colonie de toute les façons qu'elle purent. 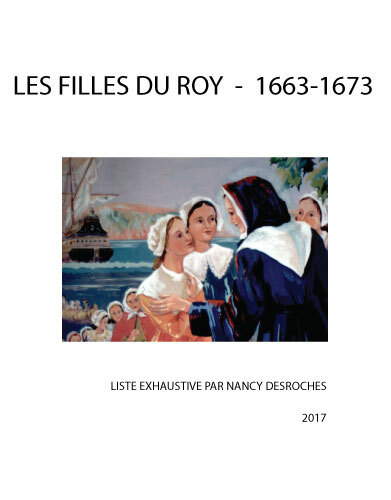 En voici la liste compilée par Nancy Desroches. 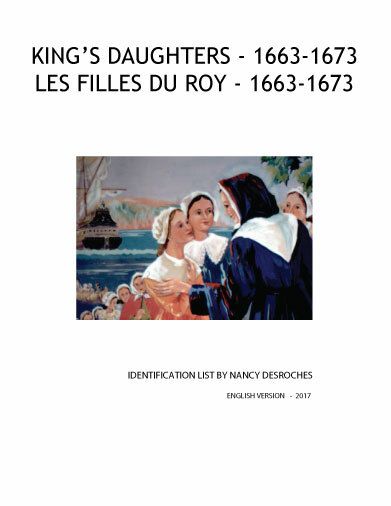 Résumé: In the reign of Louis XIV to counter the disproportion between the sexes in the colony of New France, unmarried young girls crossing in order to get married. Bold, adventurous some came in the hope of a better future and contributed to this still young colony in every way it could. Here is the list compiled by Nancy Desroches. Résumé: The Jesuit Relations are the collection of correspondence between the missionaries of the Society of Jesus sent to New France and their religious superiors in Paris. The first were written as early as 1616, but they were regularly drafted from 1632 to 16721. These relationships are among the most important sources of information about the peoples and history of New France. This is the first volume reedited in 1858. Résumé: The Jesuit Relations are the collection of correspondence between the missionaries of the Society of Jesus sent to New France and their religious superiors in Paris. The first were written as early as 1616, but they were regularly drafted from 1655 and 1656. These relationships are among the most important sources of information about the peoples and history of New France. This is the second volume reedited in 1858. Résumé: The Jesuit Relations are the collection of correspondence between the missionaries of the Society of Jesus sent to New France and their religious superiors in Paris. The first were written as early as 1616, but they were regularly drafted from 1656 to 1672. These relationships are among the most important sources of information about the peoples and history of New France. This is the third volume reedited in 1858.